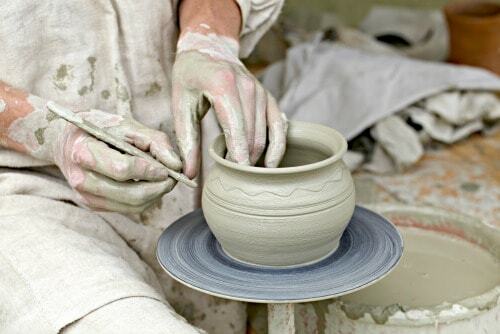 Potter’s hands making a pot in traditional style. Being careful of your choice of hobbies can make the difference between the hobby being a stress reliever, or its being a budgetary burden. In fact, if you’re careful in your choice of hobbies, you should be able to save money or, even, make some money with your products. Even though it is unseasonably warm weather at the moment, I’m thinking ahead to the fall and winter months. If the last half of this year is anything like the first half, I want plenty of warm clothing to wear. When I started thinking about this, I decided I wanted something warm to throw on over my clothing to run out to the mailbox or to help bring in groceries from the car. Where is this piece of clothing going to come from? I plan to produce it by the work of my own hands, actually. My hobbies allow me to produce clothing in a wide array of styles, sizes, and seasonality. I can crochet. I can create my own sewing patterns. I have and can use a variety of knitting machines for various gauges. I am able to hand knit, albeit slowly and unhappily! I can also alter and upcycle clothing as necessary or wanted. This is a list of a few of my hobbies. I have many more that I can use to produce needed or wanted items with a minimum of expense. Collecting non-functional bric-a-brac is just not my thing. I would urge you to consider a money-saving hobby, or a hobby which can produce a stream of income if needed or wanted. Below is a list of hobbies that I consider useful for making or saving money. I hope you might find something to try in this list. 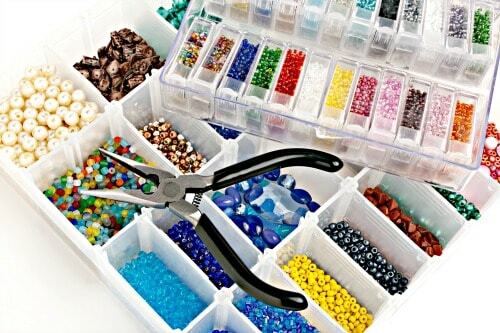 Jewelry making can be a lucrative hobby as well as a stress reliever. 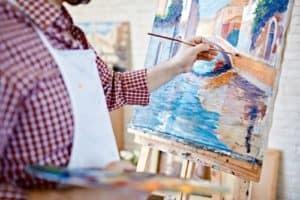 For the purposes of this article, I chose hobbies that would allow one to make things that a person would be willing to pay for, either you for your personal use or another person for their use. Thus, you would be either saving money or making money, both of which aid the slender budget. Jewelrymaking – If you have a great eye for design, this is a great way to upgrade your style and express your personality, while the possibility of selling at craft shows or farmers’ markets adds the chance to make a few bucks on the side. Knitting – This is a a mentally soothing way to spend time while making warm clothing, toys, household items, and decor items. Gardening – good way to produce flowers for arrangements, bedding plants for sale, vegetables to eat or sell, or herbs for use in soaps, body care products or home cleaning products. Gunsmithing – good way to keep self-defense and hunting weapons in good shape, upgrade them with better stocks, etc. Writing – good way to relieve stress (journaling), sell articles (freelance writing), create decor (printable quotes), or work a lot for very little (publish a book)! Canning and Preserving – goes well with a gardening hobby, foraging, or backyard orchards and makes fixing dinner much easier. Making Herbal Items – herbs can be used to make or added to things like soap, other body care items, housecleaning solutions, and some health care items (carefully researched!). Calligraphy – this artistic style of handwriting has several uses, including making occasion cards, scrapbooks, place cards for guests, and creating wall art for the home. Candlemaking – candles can provide several benefits. They can scent the air, and are often wonderfully decorative in and of themselves. They can be used for emergency lighting in case of electric service being interrupted. Oh, and they can be used to celebrate another year of life for ourselves and our loved ones. Fishing – This is an obvious source of yummy healthy food, if you have the right temperament, place, and time to work a fishing line. The advantages of spending time in nature would also be yours (and they are many and wonderful). Hunting – Like fishing, this is a source of excellent food and provides the advantages of outdoor time, combined perhaps with a bit more exercise. Flower Arranging – If you raise flowers and study up on flower arrangement techniques, you can make some decent income with selling flower arrangements. If you’ve bought a flower arrangement lately, you’ll know what I mean! Foraging – Foraging is the art and science of looking for and harvesting local wild foods. Like many of the hobbies I list, knowledge is of prime importance. Like hunting, food canning, and herbal use, a mistake could be literally fatal, so do your homework. Once you know what you are doing, though, you can give your dinners a jump in freshness, vitamins, and minerals very easily, for little to no money. Metal Detecting – This is a ton of fun, although you may not get rich. To up your chances of finding something of use, ask for the landowner’s permission to make sweeps across parking lots after large events or across beaches or other crowd-gathering places after weekends. Home Brewing, Winemaking, Beverage Production – Beers, wines, ciders, root beer and other sodas, kombucha, kefir, flavored vinegars for shrubs, fruit cordials — there are so many beverages that can be home produced. These are much better for you than the powdered drink mixes one can buy. Knifemaking – I was amazed at all the ways knives can be changed for various uses, from the style of the tip to the type of handle and everything in between. If you have a very specific combination of characteristics in mind for your dream knife, this is the hobby that gives you a chance to make it happen. Pottery – This is the art of creating and decorating clay articles — often pots, thus the name — and firing the items to make the items hardy and useful. Strength and creativity are useful attributes to bring to this hobby, depending on the type of pottery you intend to produce. Wood Carving — This is one of the oldest skills ever developed. The results have been used in everything from making combs for the hair to decorating the finest church buildings. This is one skill that demands a constant attention to safety, but if this is something you want to learn, you can apply the results in so many ways that no one can easily list them all. Food Fermentation – Ever wonder why your older family members declare today’s pickles to be not as tasty as the old-fashioned ones they ate in their youth? The difference is in the process of pickling. Today’s pickles are soaked in spiced vinegar, which can cause a harshness to their taste. Yesterday’s pickles were fermented — a long process that included the growth of certain types of bacteria, leading to a better overall taste. There are many people who believe that fermented food is much better for our health also. Because you want this hobby to be a stress reliever as well as a possible money making activity, be sure to consider your choices carefully. Make sure that you feel some true interest in the possible hobby. Also, consider what the start-up costs might be — tools, materials, books or other sources of information. Spending more money than you have available will not relieve stress! Also, consider whether you want to indulge in a hobby that can be enjoyed when you are alone or whether you hope to be active in a group with other hobbyists. If you want to be part of a group, make sure there is one available in your area that meets at a time you can attend. ed. Placing all the tools and so on in a cabinet with good intentions will not relieve stress or cause enjoyment. For the best stress reliever results, take up your new hobby actively and enjoy it!